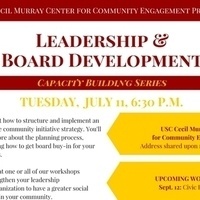 On July 11, find out how to structure and implement an effective community initiative strategy. You'll hear more about the planning process, including how to get board buy-in for your projects. Join us at one or all of our workshops to strengthen your leadership and organization to have a greater social impact in your community. For more information and to register, contact Rev. Najuma Smith-Pollard by email at damalism@usc.edu with your name, organization and phone number.